Commvault (NASDAQ: CVLT), a global leader in enterprise backup, recovery, archive and the cloud, today introduced new innovations in the Commvault Data Platform for Software Defined Data Services, enhanced orchestration and simplicity, extending its leadership in the backup, recovery and archive space. Launched at its inaugural customer conference, Commvault GO 2016, being held this week at the Rosen Shingle Creek in Orlando, Fla., these and other innovations announced today address the increasing demands facing CIOs, business leaders and IT decision makers as they seek to create value out of their data in today’s fast-paced, global business environment. With enterprises across the world facing a tipping of point of disruption brought on by the move to the cloud, the explosion of applications, increasing demands for security and compliance, anywhere computing, and expanding volumes of data, Commvault continues to accelerate its pipeline of innovation with key new innovations to the Commvault Data Platform and solutions portfolio that eliminate data management complexities. The most significant disruptive force in the IT industry today is the move to the cloud. Building upon its track record of leadership in managing data in the cloud, Commvault announced expanded capabilities for Amazon Web Services (AWS) beyond virtual machines to include protection of databases, further enabling enterprises to implement holistic data management strategies on premise or in the cloud. Commvault also announced new backup, migration and data protection capabilities for applications and workloads in Oracle and Azure clouds. This added support further showcases Commvault as the only data protection and management provider that can drive a true enterprise cloud strategy for customers, with support for more than 25 public clouds and an increasing range of cloud-based or cloud specific workloads. 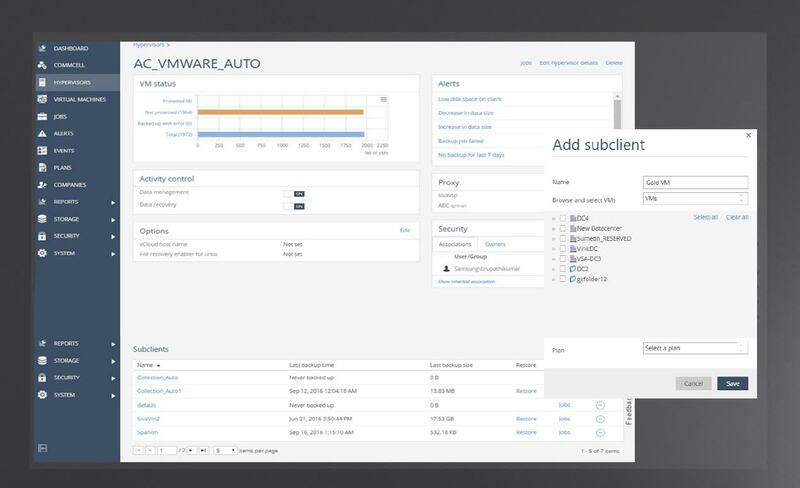 To make it easier for users to quickly and easily configure, run and monitor their environment, Commvault announced a new series of role-specific user interfaces on HTML-5 including a new admin console for database and virtualization administrators to help users run and monitor their Commvault environment. These new consoles enable users to run extensive graphical and visual representations of KPIs, utilization, operational health and other metrics, and can be personalized based upon their role within the organization. These new user interfaces further complement Commvault’s powerful and proven java-based console to meet the needs of their customers. With more pressure than ever before on organizations to drive agility and automation in their execution and routines, while creating value out of their data, Commvault has enhanced automation capabilities in its platform. The capabilities represent a critical core capability for the Commvault Data Platform – along with the dynamic index and the single, virtual repository – as it extends to new workloads like big data, simplifies the workload management, and storage and access of data. These capabilities simplify the way customers incorporate the cloud in any aspect of their solutions, from simple backup to cloud, to migrating workloads, to automating data recovery in the cloud. The orchestration capabilities help customers tailor their use for the cloud to their specific requirements, while simplifying the management, movement, monitoring, backup and retirement through automated workflows. This is highlighted through Commvault’s broad workload portability capabilities that enable “on the fly” transition of workloads and their data between hypervisor and the cloud. Commvault’s powerful automation also supports on premise workloads by automating complex data access and data refresh requirements to drive more agile dev/test and innovation strategies. Companies are exploring new options to scale storage and reduce their traditional legacy spend, specifically around their backup, recovery and archive solutions and therefore need a platform that can scale and perform in a way that tracks to their business needs. Commvault is now enhancing its platform with software defined capabilities, giving customers a level of performance and scale for backup, recovery and archive that parallels the performance and scale found in many big data and digital repository environments. By delivering these infrastructures options, Commvault has enabled customers to leverage new solutions specifically tailored to big data and digital workloads. Through the Commvault Data Platform and these new Software Defined Data Services, Commvault helps to free organizations from vendor lock-in, drive lower cost than legacy approaches, provide greater agility and flexibility, and enable IT to become scalable and better performing. With new APIs announced at Commvault GO that extend the openness of the Commvault Data Platform, Commvault strengthens its long standing market leadership in integrating its data protection solutions with the broadest range of on premise, virtual, cloud and distributed environments. With customer environments for applications, workloads and infrastructure getting more complex across type, vendor and other areas, managing this complexity increasingly requires a smart, simplified and holistic approach to enable true data management. The Commvault Data Platform enables simplicity by providing an ever growing number of built in APIs designed to connect these various environments. The APIs in the data platform provide a way for customers to mix traditional and new workloads on nearly any infrastructure and aid them in transforming those workloads onto new or different infrastructures. The copy data management market is focused on enabling the business technology user to achieve their business goals, whether they need to become more agile, accelerate time-to-market, or capture new customers. Historically, this space has been dominated by siloed solutions for specific IT applications – resulting in customers often purchasing a complex array of different disparate solutions. With block level copy data management and support for flash storage array and cloud replication, Commvault’s fully integrated Data Platform allows customers to eliminate this siloed approach, lowering costs, speeding processes and eliminating complexity. Building on one of the industry’s broadest coverage of storage arrays, virtualization platforms, and enterprise applications, Commvault also announced today that Commvault IntellSnap has extended its support for array-based replication to Pure Storage flash arrays. As a result, customers can maximize the value of their Pure Storage investment to efficiently capture, move, retain, find, analyze and recover data. Today’s announcements come in conjunction with Commvault’s inaugural customer conference, Commvault GO 2016, which brings together Commvault users, partners, employees, analysts and industry luminaries for three days of dynamic presentations, inspiring knowledge exchange and empowering networks opportunities. Keynote sessions are being held by Gartner’s Dave Russell, technology evangelist Robert Scoble, Microsoft’s Steve Guggenheimer, Cisco’s Satinder Sethi, ESG’s Steve Duplessie and critical thinker Adam Savage (formerly of Mythbusters).Attendees will also hear from technology evangelist, Robert Scoble, the event emcee, and ComputerworldROI magazine Founding Executive Editor, Julia King, who is moderating a panel focused on Computerworld’s Premier 100. Commvault GO 2016 is currently being held in Orlando, Fl.